When it comes to collection, I could talk for days. It’s one of the most important and most misunderstood topics when it comes to riding. I’m going to start by explaining what it is and what it is not. Collection is when a horse carries more weight on its hind end than its front end. When a horse is standing or roaming around freely it will have 60% of its weight on its front end and 40% on its hind end. When a horse is collected, those numbers should be swapped. They will drive their hocks further underneath themselves when they are collected. Their front end will be slightly elevated and they will be able to perform any athletic maneuver more proficiently from this position. I grew up showing horses with my three older sisters. We did 4-H and high school equestrian team and spent a ton of time taking care of our horses, taking lessons, competing and learning. I owe so much to my parents and sisters for the start I had in the horse world. We didn’t have “push button” horses. We had to work hard to make ours work well for us and show well. I remember what a struggle it was to get my horse to look collected. It seemed like I was endlessly trying to get them to keep their heads down and their movements slower and more collected. If only I knew then what I know now. Collection has very little to do with “head set”. Trying to obtain a “head set” with a horse is kind of like putting the cart before the horse. It is possible to have a headset without true collection but if you have true collection, you’ll have a nice natural headset as a result. It is for this reason that I seldom use draw reins or other mechanisms to “set” a horse’s head and neck. I think more times than not, they will fool you into thinking they are collected when in reality they are becoming more and more dumpy on their front end and leaning on the bit. Draw reins can be used correctly if you have great timing and you can feel when your horse is using their hind end and not just diving down into the bridle. Collection is all about power. 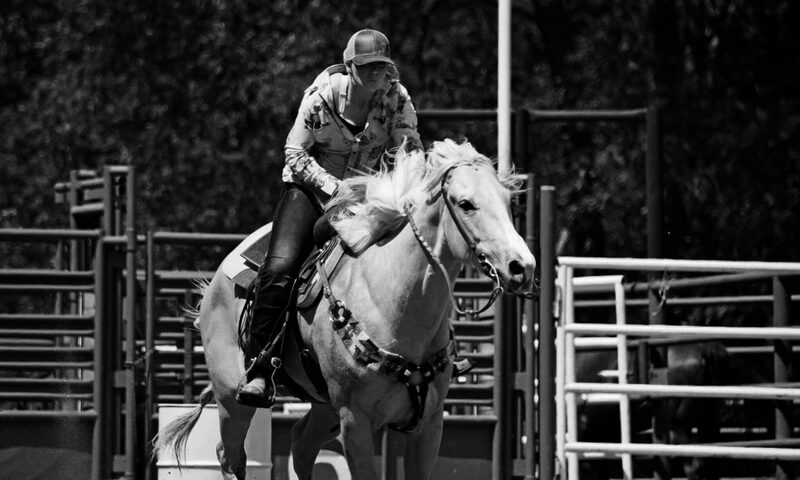 It’s putting your horse in the position to respond in a powerful, athletic way. If you aren’t sure if you can recognize or feel the difference when a horse is collected or not, find someone who does and ask if you can watch them ride. Watch people lope circles at the barrel race or show and see if you can pick out what horse is driving their hind end further under them. Which horse is slightly elevated in the front end? Can you pick one out that looks hollowed out? The purpose of this isn’t to be critical, the purpose is to be obsevent. Developing a better eye for collection will help you have better feel on your own horse. There is no magical bit, tie down, or contraption that can replace a rider with good timing and feel. A horse has to be taught how to be collected and stay collected over time. There is no over night fix, as least not one that has any lasting power. Developing collection one step at a time will create positive muscle memory and keep your horse from getting frustrated and resentful of training. Once your horse knows the concept of being collected, there are bits that will help enhance the foundation they have and allow you to communicate with them in a more refined way. In short, collection is the beginning of developing a stronger, more athletic horse. It’s kind of like going from driving a station wagon to stepping on the gas in a brand new Ferrari. For a barrel horse, collection will translate into more balanced turns, better footing and more explosive speed leaving the barrels. And who doesn’t want that? Check back in if you are interested in learning a few ways to start working on collection with your horse, I’ll be getting some video footage together soon! Wow thank you for this information!